Other than greasy fries, baked potatoes, especially loaded, are my favorite way to eat potatoes. In the winter I eat baked potatoes all the time. So when I came across a recipe for loaded baked potato soup without a million calories, I was so there. This was all the deliciousness of a loaded baked potato, but in soup form. Personally, I love broccoli with potatoes, so I added that to the original recipe. Scrub and dry potatoes; pierced them several times with a fork. Place the potatoes on a microwave safe plate and microwave on high for 13 minutes or until potatoes are tender. Cut potatoes in half and set aside. While the potatoes cook, heat the oil in a pot over medium-high heat. Add onion and sauté for 3 minutes. Add broth. In a small bowl whisk together flour and ½ cup of milk. Add the mixture to the pot along with the remaining 1 ½ cups of milk. Bring to a boil, stirring frequently. Add broccoli, return to a boil stirring frequently. Cook for 1 minute. Remove pan from heat. Stir in sour cream, salt, pepper, and 4 tbsp bacon bits. Set aside. Scoop the potato pulp out of the skin and mash it into the soup. Discard skins. 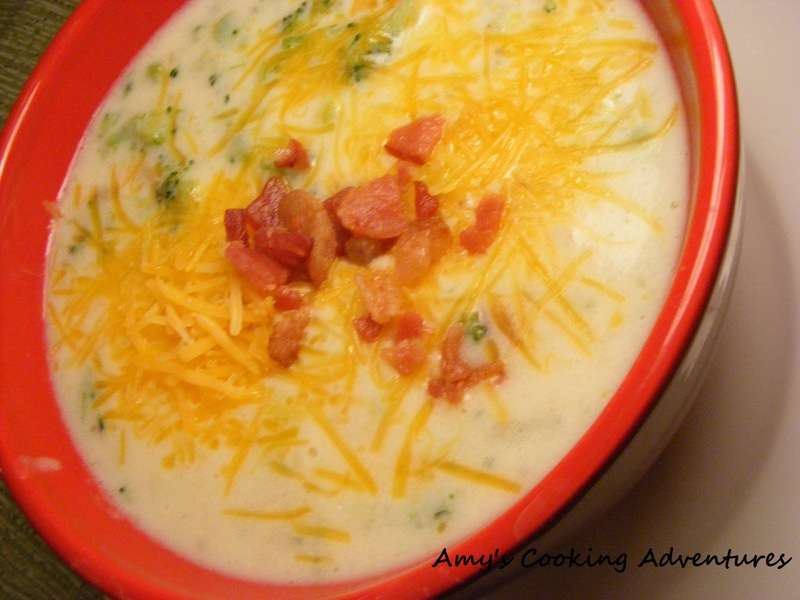 Garnish each serving of soup with cheese and remaining 2 tbsp bacon bits. 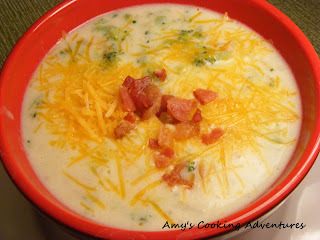 Amy, this is comfort food at it's best! Yum. Amy this is genius! I love love the idea of making a lighter loaded baked potato soup. Thank you so much! This was delicious on a cold winter day!